Haikara were a progressive band from Finland that released (I think) four albums in the 1970's. Geafar was the band's second album, originally released in 1974 and now re-released on Jussi Lehtisalo's Ektro Records label. In addition to the five tracks that appeared on the original album there are four bonus tracks recorded between 1976-1979. The music, at its hottest, is an interesting blend of fiery Canterbury and fusion, with a hint of Henry Cow-styled RIO. Stir in a potent Zheul bass that adds a bit of Magma to the mix, plus aggressive horns and you've got some killer music that is quite difficult to describe. "Change", "Kun Menet Tarpeeksi..." (long title), and "Geafar" are the smokers from the original LP. Listening to "Kun Menet Tarpeeksi..." I wonder if later 70's French adventurers like Etron Fou Leloublan and Les i were influenced by Haikara? The sax and rhythms are similar, though the guitar is more prominent with Haikara and the music more fast paced. The guitar/sax duel is a joy and there are brief quieter moments of operatic female vocals. The title track, "Geafar" features a vocalist that reminded me of Dagmar Krause, adding gorgeous dissonance to the music. And the choppy, but perfectly timed beats remind me of the Canterbury school's more eclectic moments. At 14 minutes the music evolves through a number of varied but related themes, many of which include impressively smoking instrumentals. I love the moments when the fuzzy (but non-acidic) guitar duels with the sax while the Zheul bass and drums keep the pace moving swiftly along. 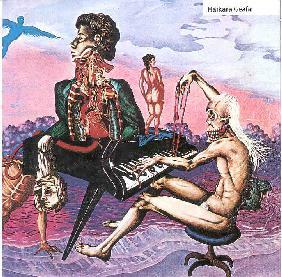 But Haikara have their quieter, more classically progressive influenced moments as well, as heard on "Kantaatti" and "Laulu Surulliesesta Pilvestä". Both include imaginative arrangements of piano, violin, and operatic female vocals. Quite the opposite intensity level from the other three tracks, but the music is just as well done and it's nice to hear a different side to the band. I'm afraid I can't say the same for the bonus tracks though. These are safe songs, a couple of which reminded me of later 70's Camel during their more song-oriented period. The melodies on "Picnic" are downright cheesy. "Jumbo" is the best of the four, being more in a fusion direction, but still doesn't approach the inventive music heard on the original album. Overall, however, I'd recommend checking out the disc for the tracks from the original LP. Fans of 70's progressive history into Canterbury, fusion, and the more accessible RIO bands will want to hear this. In fact, an internet search turned up very little information on Haikara. A little known band from the 70's that deserves to be heard. Available from the Ektro Records web site.